Here's another project for the season. If Christmas is your holiday as it is for most of my family, that's great. Imagine Santa's presents and eight reindeer. If Christmas isn't your thing, the project may even be useful for anybody who does not hate the idea of snow and winter. The next project up is a horse to pull this sleigh. I was thinking of the "One Horse Open Sleigh" song while making this project. use<filename.scad> provides a way to use separate "library" files within another scad file. In this case the two sleigh skids were developed as separate files and combined into the final version of the sleigh. Of course, the instructions for the two skids could have simply been incorporated into the final file, but it is good to develop module practices, from what I have read. That will prepare you to make complex projects from parts you have designed for later combination. I suppose I'll get there someday, too. This experience should prove to be valuable. For your file viewing pleasure, the viewport variables are set so you can see the finished scad design from a nice angle. Note: The introductory image above shows an alternate view of the sleigh with the skids in place "as built", though not printable that way. The printable layout puts the two skids beside the sleigh box. Each skid has a slight tilt on the upper crosspiece. They are intended to fit so the sliding skid will be tilted out on each side. Be alert to mount them correctly. Superglue is my choice for PLA plastic. Put the glue onto the tilted crosspiece and hold the skid in place for a minute or so and set the sleigh upside down to dry before adding any paint; acrylic is recommended. 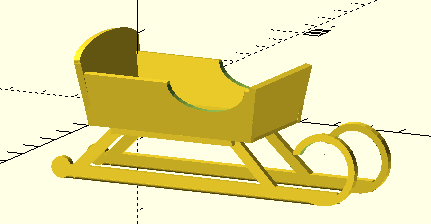 sleigh01-withskids.stl - print without modification.